One of the most popular styles in the late 1800's into the 1930's. The cubical shape made the most of every buildable inch, taking full advantage of small building lots and small budgets. Indeed it was the most house for the lowest cost, while maintaining a dignified appearance (something like the split-level of the 1960's). The versatility of the Foursquare, usually built without the benefit of an architect, lent itself to endless variations. 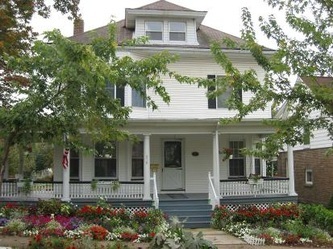 The Foursquare is what most people think of as "the all-American family home" on Main Street USA. The 1876 Philadelphia Centennial inspired a new interest in American colonial past. 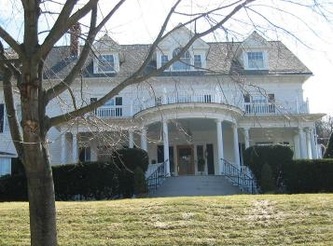 Architects studied colonial styles throughout New England by 1890s. 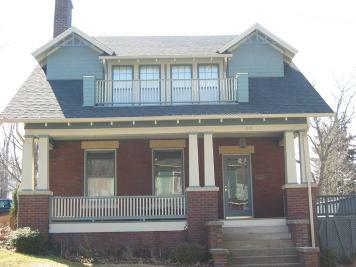 Colonial Revival was a dominant style for domestic buildings nationwide 1900-1940s. Georgian and Adam styles were the backbone of revival ideas, with a secondary influence of Dutch Colonial (with Gambrel roof). Often credited to the Greene and Greene brothers and their architectural firm in Pasadena, CA. In 1902-1903, the Brothers were influenced by the vernacular style of board and shingle buildings in California. The brothers depended most on wooden construction. The bungalow form became the common builder's house between 1910-1920. Numerous "bungalow books" promoted the new style and form. The type, with many variants, included these features: low, gabled, one or one-and-a-half storied house; front pitch of roof extended to shelter a large porch (incised porch). The first bungalows were supposedly modified from a very generalized Indian country vernacular form - Indian bungalows, hence the term. However, the only distinguishing feature of Indian bungalows consisted of the spreading roof extending over a porch surround. Nonetheless, the term "Bungalow" came to be used as a general term for any variant on this Indian theme throughout the U.S. 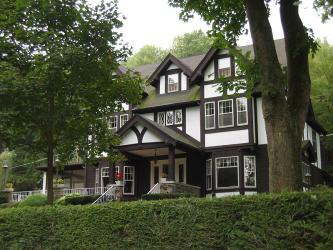 Identified by low-pitched, gabled roof, wide overhang of eaves; decorative (false) beams or braces under gables; incised porch (beneath main roof); tapered, square columns supporting roof; 4-over-1 or 6-over-1 sash windows, often with Frank Lloyd Wright design motifs; hand- crafted stone or woodwork, often mixed materials throughout structure. The Dutch Colonial Revival style mimicked 1600's and 1700's Colonial homes with gambrel roofs (popularly called Dutch Colonial; but the gambrel roofed homes were built by English and other immigrants as well as the Dutch). Gambrel Roof with wide overhang, a steep stepped gable with a porch under the overhanging eaves. 8 over 8 windows and dormers common. Usually built of wood, brick or stone, in widely varying sizes. 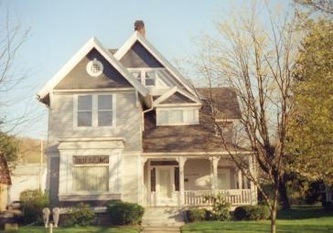 The Eastlake Style was simply a decorative style of ornamentation found on houses of various other Victorian styles, primarily the Queen Anne and Stick Styles, but entire homes can be classified as Eastlake as well. It is named after Charles L. Eastlake, an English architect who wrote "Hints on Household Taste," published in 1868. The book was reprinted in America in 1872 and became so popular that it required six editions within eleven years. Eastlake style became a kind of catchall term meaning different things to different people. Eastlake styled homes includes wooden forms such as porch posts, railings, balustrades, barge boards, braces and pendants turned on mechanical lathes. Also large curved brackets, scrolls etc at every corner or projection of the façade. A profusion of beaded spindles and lattice work along porch eaves. The French Second Empire style was the first true style of the Victorian era in the U.S. The style was most popular in the Northeast, Midwest; rare in the South. Also known as the "General Grant style", used during the Grant administration for public buildings. Historical context: Style named for the reign of Napoleon III (1852-1870), who undertook a major building campaign to transform Paris into a city of grand boulevards and monumental buildings - copied throughout Europe and North America. Napoleon's famous project: enlargement of the Louvre (1852-1857), reintroduced the Mansard roof, developed in 1600s Renaissance by Francois Mansart. Style diffused from France to England to U.S.
Basically Italianate style/forms with Mansard roof!! Dormer windows, sometimes a square (not round) tower, decorative brackets, molded cornice, similar to Italianate detail on windows, doors; Floor plan often includes pavilions: outward projection of a building's center or side. 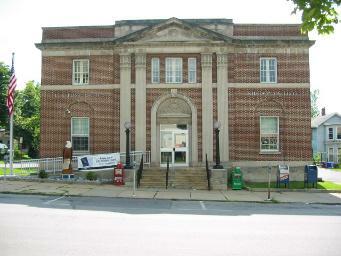 Among the most long-lived styles of American building. The original Georgian style was named after the four kings named George who reigned successively during this period. Rooted in the classical design principals of ancient Rome, this English style came to America by way of British pattern books and an ever-swelling wave of masons, carpenters, and joiners who emigrated from England. Georgian was the dominant style of the English colonies. The style reflected Renaissance ideals, made popular by architect Sir Christopher Wren after 1650. Curiously, Pennsylvanians continued building Georgian row houses until the Civil War, while New Englanders had abandoned Georgian style mostly by 1800. The style has Renaissance-inspired classical symmetry, with a rectangular, strictly symmetrical, balanced façade with elaborate fanlights and sidelights. Central bay of facade slightly projected and crowned with pediment. Sometimes the center entrance was framed by a portico with free-standing columns. Hipped, double-pitched, or gambrel roof. Chimneys placed to contribute to overall symmetry. Hipped roof often topped with a flat deck with surrounding balustrade. A central cupola also sometimes capped the roof. Classical cornice detailing. Generally in brick or wood. The Gothic Revival style was popular between 1840-1860 for houses, but never as popular as Greek or Italianate styles. 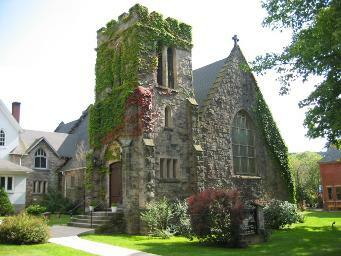 It remained popular for churches nationally through the 1940s. Most abundant in the Northeast. Style began in England 1749 to romanticize medieval styles. The first American Gothic house: by Andrew Jackson Davis, 1832, in Baltimore. 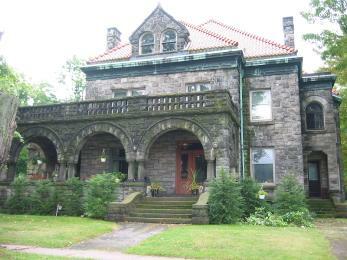 Davis was the first American architect to promote Gothic style, in his book: "Rural Residences. Gothic was mostly promoted as a rural style, not urban, since it didn't fit typical city lots. Characterized by steeply pitched roof, cross-gabled, decorated vergeboards, pointed-arch windows, sometimes stained glass, like churches. Gothic window above entry, one-story porch with flattened, Gothic arches. The first appearance of picturesque (asymmetrical and unpredictable) floor plans, indicating the rise of the Romantic Era in America. 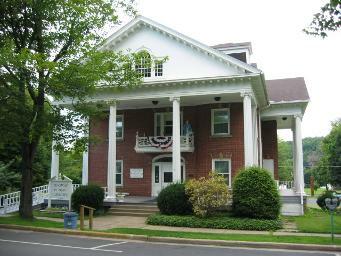 Greek Revival was the dominant style in America from 1820-1850. Also called "national style" due to its popularity. It was also known as the "Territorial style" in early Western towns, including Santa Fe, NM. The style diffused westward with settlers (especially New Englanders, across upstate New York), and was the first American architectural style to reach the West Coast. Thomas Jefferson inspired the Greek Revival movement, which became widely accepted throughout the early U.S. as a symbol of the new democracy. Greek place names, street names, and architecture became dominant throughout the Northeast. Curiously, Pennsylvanians adopted the Greek Revival style only in minimal ways, preferring instead the tradition of the Georgian row house, right up through the Civil War. 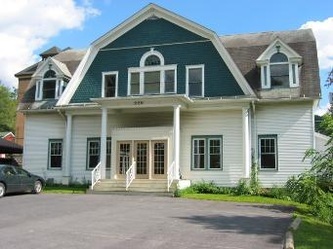 Features include gable or hipped, low-pitch roof; dentil cornice emphasized with wide band of trim -- cornice represents classical entablature (includes cornice, frieze, architrave); porches: square or rounded columns (usually Doric), first style to use gable-front floor plan (gable end facing the street, representing Greek temple), temple-front entryway with entry door surrounded by rectangular transom and sidelights (never rounded like federal). 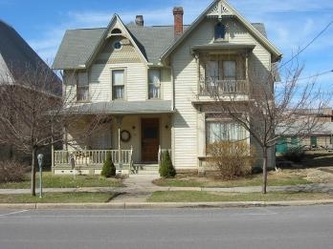 The Italianate style dominated American houses between 1850-1880. The style was common in expanding towns and cities in Midwest, and still-growing older cities in Northeast. Least common in the South. Very common in San Francisco. Style began in England as part of the picturesque (Romantic) movement: a reaction to formal classical ideas. Emphasized rambling, Italian farmhouses. In U.S., houses followed the informal, rural models of picturesque movement. 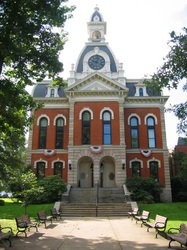 Modified for use as typical "main street" commercial architecture in Midwest. Popularized by Andrew Jackson Downing, 1840s, 1850s, with Gothic Revival. By 1860s, Italianate overshadowed Gothic Revival as most popular style. 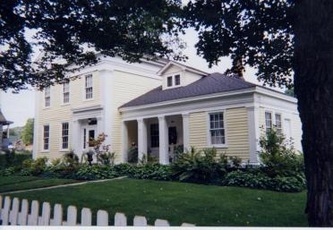 Usually 2 or 3 stories, rarely 1 story; low-pitched roof, widely overhanging eaves; large, decorative brackets beneath eaves; tall, narrow windows, commonly arched or curved above; some with square cupola or tower (campanile), elaborate wrap-around porch (or smaller entry porch) with decorative Italianate double columns and other details. 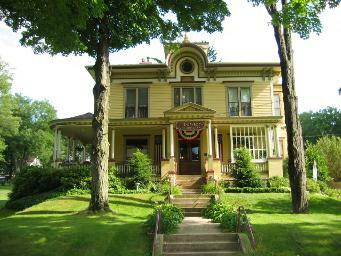 Italianate commercial design appears throughout the business area of the Ridgway Historic District in addition to the Italianate domestic style seen throughout the residential areas. Neoclassical became a dominant style for domestic buildings nationwide between 1900-1940s. It was directly inspired by the Beaux-Arts style and the Columbian Exposition: classical symmetry, full-height porch with columns and temple front; classical ornament. Basically, this is the revival of the Greek Revival style. Ranch style housing evolved from several other twentieth century styles, including Prairie school, Bungalow, Cottage and Spanish. Traditional Ranch homes reflect a hard-working, simple life and are often considered a expression of the informality of Western culture. Because these homes are uncomplicated, critics often say the Ranch style has no style. The style is also dismissed because it has become so common. "Ranches" are found in the suburbs throughout North America, making the style synonymous with the concept of tract housing: fast-built, cookie-cutter homes. The first Ranch home, designed by Cliff May, was built in San Diego, California in 1932. Over the next 20 years, thanks in part to the popularization of the automobile, Ranch-style houses spread to other states and were the dominant home style of the 1950s and 60s. Today, many new homes have characteristics of the relaxed, informal Ranch style. (1) Early Romanesque structures resembled Gothic predecessors with Roman forms. Mainly for public buildings. Best example: Smithsonian Institution building (1847-1855). (2) Style of Henry Hobson Richardson: attended Harvard, then to France to study architecture. Experimented with variety of sources for his own unique style: polychromed walls, Syrian arches, sculpted shapes, Romanesque forms. Became a truly American style. Became an almost universal style for public buildings: churches, libraries, train stations, courthouses, schools. Rare for houses due to massive construction requirements, mainly for society's elite class. Style includes round arches over windows and/or entryways; thick, cavernous entryways and window openings; thick masonry walls, rounded towers with conical roof; facades are asymmetrical; variable stone and brick façade. On elaborate examples, polychromatic facades with contrasting building materials. This American style originated in cottages along the trendy, wealthy Northeastern coastal towns of Cape Cod, Long Island, and Newport in the late 19th century. Architectural publishers publicized it, but the style was never as popular around the country as the Queen Anne. Shingle homes borrow wide porches, shingles, and asymmetrical forms from the Queen Anne. They're also characterized by unadorned doors, windows, porches, and cornices; continuous wood shingles; a steeply pitched roof line; and large porches. The style hints at towers, but they're usually just extensions of the roof line. Tudor revival became especially popular with 1920s suburban homes, loosely based on late medieval prototypes. Many are identified with false (ornamental) half-timbering, a medieval English building tradition, often with stucco or masonry veneered walls, steeply pitched roof, cross-gabled plans. A variant of this is sometimes referred to as the picturesque cottage or English cottage, which typically includes a picturesque (asymmetrical) floor plan but without the half timbering.